Carbohydrates are interesting and challenging targets for supramolecular chemistry. They are biologically important, their structures are complex, and they are very happy to remain in water (where they are usually found). Designing effective carbohydrate receptors is thus exceptionally difficult, especially if they are to be deployed in water. We have been interested in this problem for more than two decades. In our early work we avoided the problem of carbohydrate hydrophilicity by studying binding in organic solvents. However, since 2005 we have been able to address the key issue of carbohydrate binding in water. Our strategy has been to target glucose, and related carbohydrates which possess all-equatorial arrays of substituents. These may be complemented by pairs of aromatic surfaces linked by polar spacers. The aromatic surfaces should make favourable hydrophobic and CH-π contacts with the carbohydrate’s axial CH groups, while the spacers form hydrogen bonds to the polar substituents. These ideas were first realised in the form of macrotricycle 1, where the aromatic surfaces are biphenyl units and the spacers are isophthalamides. Initially we found that 1 was capable of binding glucose in water very weakly (but still to an interesting degree, considering the difficulty of the problem). Later we discovered that this receptor was much more effective for β-linked N-acetyl glucosamine 3 ( β-GlcNAc), an important biological target. Remarkably, the affinity and selectivity were competitive with the lectin (carbohydrate-binding protein) Wheat Germ Agglutinin, often used to bind β-GlcNAc. The combination of 1 and 3 was unusually suitable for NMR studies, yielding a precise 3D structure for the complex (as shown). We also found that by adding propoxy groups to give 2 we could redirect the selectivity back to glucose. Receptor 2 bound glucose with sufficient strength and selectivity to suggest that it might be useful for medical glucose monitoring. By increasing the size of the aromatic surfaces we have also been able to target all-equatorial disaccharides. 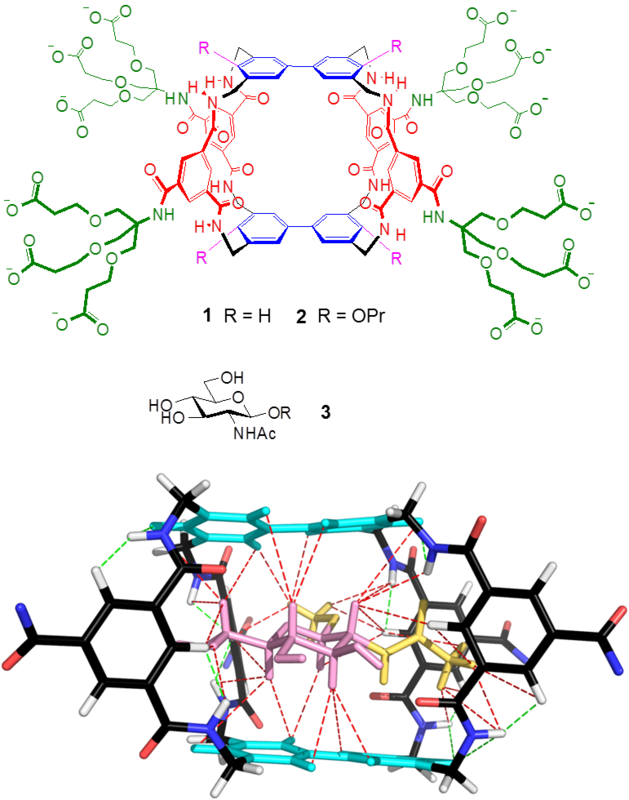 For example, the tetracyclic receptor 4 was constructed from meta-terphenyl units and 5 of the isophthalamide spacers. Again this system showed good affinity and selectivity for its substrate, in this case the disaccharide cellobiose 5. Most recently, we have discovered a much simpler means of creating a binding site for glucose. The receptor 6 can be prepared in a single step from our standard spacer precursor and a commercially available anthracenediamine. Remarkably, glucose is bound as strongly and selectively as by the tricyclic 2. The process is readily followed by fluorescence spectroscopy suggesting, again, the possibility of sensing applications. At time of writing we have developed a few receptors which compare quite well with some natural lectins for one family of carbohydrate substrates. In the future, we hope to make systems which can match the most effective lectins, and can bind other families of saccharides. Success would result in a suite of molecules which could complement natural lectins as research tools and diagnostic reagents. New avenues for therapy may also be opened. Carbohydrate recognition mediates a range of biological phenomena including protein folding and trafficking, cell–cell recognition, infection by pathogens, tumour metastasis and many aspects of the immune response. Agents which interfere with these processes could have novel biological effects, some with medical implications. A. P. Davis and R. S. Wareham, Angew. Chem. Int. Ed. 1999, 38, 2978. E. Klein, M. P. Crump, A. P. Davis, Angew. Chem. Int. Ed. 2005, 44, 298. Y. Ferrand, M. P. Crump, A. P. Davis, Science 2007, 318, 619. Y. Ferrand, E. Klein, N. P. Barwell, M. P. Crump, J. Jiménez-Barbero, C. Vicent, G. J. Boons, S. Ingale, A. P. Davis, Angew. Chem. Int. Ed. 2009, 48, 1775. N. P. Barwell, M. P. Crump, A. P. Davis, Angew. Chem. Int. Ed. 2009, 48, 7673. B. Sookcharoenpinyo, E. Klein, Y. Ferrand, D. B. Walker, P. R. Brotherhood, C. Ke, M. P. Crump, A. P. Davis, Angew. Chem. Int. Ed. 2012, 51, 4586. C. Ke, H. Destecroix, M. P. Crump, A. P. Davis, Nature Chem. 2012, 4, 718.